Some of our favourite mountains need to take a long hard look in the mirror according to these crushing reviews on TripAdvisor! Beautiful Blencathra, the home of Sharp Edge and one of the northernmost fells in the Lake District needs the diggers bringing in if it's to compete in the modern tourism trade according to this reviewer. And that's not the end of his complaints – the signage is poor and the mountain is 'generally cold and wet' reveals the whistleblower, who was also disappointed to find 'Nothing to see or do' at the top. 'Lake District Park authority take note'! England’s highest peak and the object of Romantic poets, painters and a million walkers' dreams is 'As over-rated as the lake in front of it' – the sombre beauty Wast Water of course – according to this one-star reviewer. And that's before you get to the long wait for the RAC that's somehow the mountain's fault. On the plus side, 'We were picked up in a large truck driven by a very nice bloke who took us the 97 miles home' – so not all bad then. 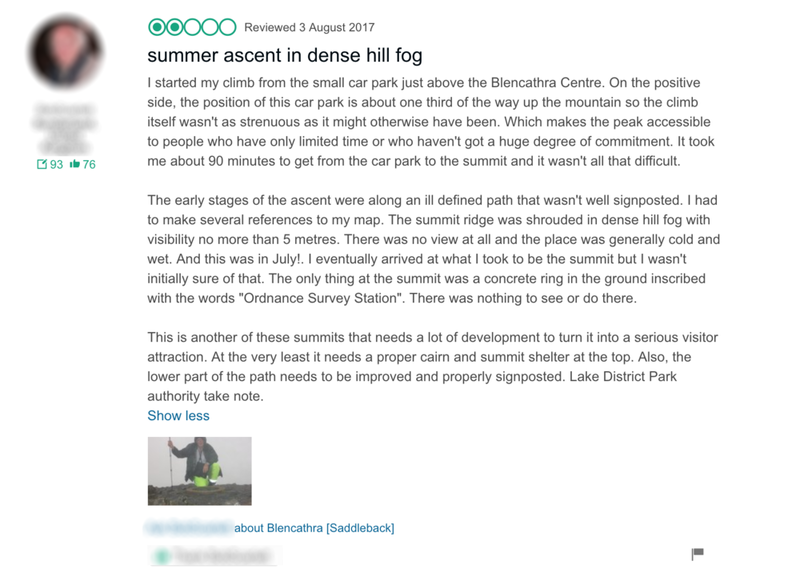 Britain's highest peak gets a damning one-star score from this reviewer whose comprehensive slating includes criticism of its steepness, height and lack of a restaurant on top. 'This was almost a FULL day's climbing' bemoans our betrayed hero; 'My girlfriend was crying at one point'. To compound a disappointing walk which 'Basically went on for far too long' when they got to the top there was a surprise in store: 'There was nothing there. (Snowdon has a pub, restaurant and toilets). Luckily we had brought some sandwiches. Anyone else climbing this one BE WARNED.' But the reviewer save his coup de grâce for the final line: 'This attraction is free but I honestly couldn't imagine anyone – and I mean anyone – paying to climb this.' Ben Nevis couldn't be reached for comment but is believed to be considering its position.